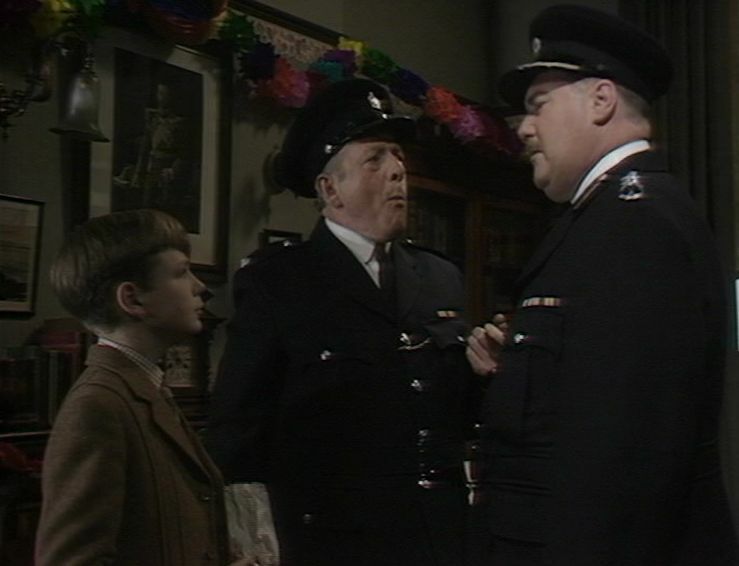 Following his threat in the last episode, Abner Brown now seems determined to stop Tatchester Cathedral celebrating its Thousandth Christmas Midnight Service. He gains nothing from doing this, but since he seems fated not to have the Box of Delights it’s one way of getting a measure of revenge. Later, he decides to flood the dungeons when it’s clear he’s lost completely – which is the final sign that his grip on reality has gone. He dispatches two creatures of the night (both created very nicely with traditional animation and mixed well into the picture) to prevent anybody getting to Tatchester – by road, rail or air. Abner and Cole Hawlings face off. It’s at this point that Abner realises he’ll never possess the Box and so he decides to take everybody with him (by flooding the dungeons). Hawlings and Kay manage to escape and find Peter, Caroline Louisa and the Bishop along the way. It has to be said, it’s a mystery why Cole Hawlings allowed himself to stay locked up for so long. He was able to create a key from nothing more than a piece of card and a stub of pencil, not to mention turning his hat into a motorboat – so maybe he just liked the underground ambiance? Abner Brown’s final moments (as he sinks beneath the cold, dark water) is nicely shot and accompanied by a musical sting from Roger Limb that sounds not unlike the music he composed for Revelation of the Daleks the following year. So, all’s well that ends well. Thanks to Herne the Hunter and the old lady everybody gets to the Cathedral in time for the service. After the adventure, this gives us time to catch our breaths – and it’s suitably Chrissmassy. It’s even more impressive when you realise that the service was shot during the day and at the height of summer, with black paper over the windows to hide the sunlight! Not everybody is in favour of the ending, but it’s as good a way as any to conclude the story and bring Kay back to reality. 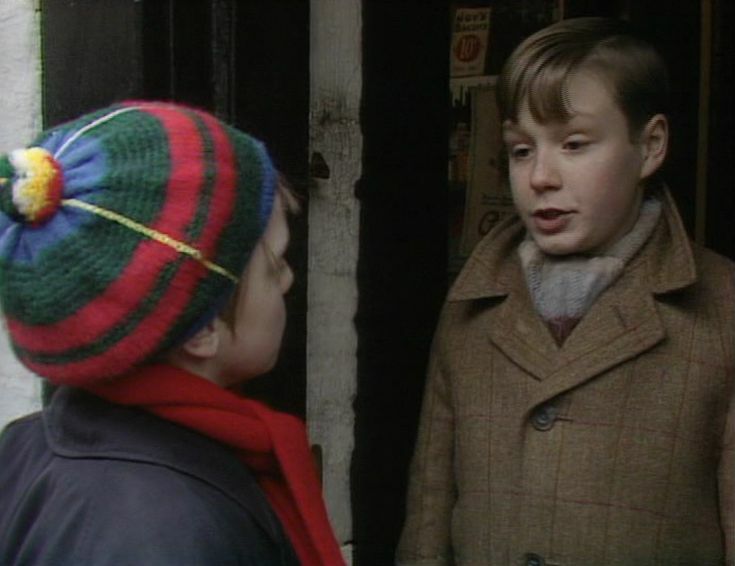 Thirty years on, The Box of Delights is still as enjoyable as ever. Whilst the production does occasionally overreach (particularly with the CSO effects) so much is right (the animation, the music and especially the actors) that it seems churlish to complain. It’s always a Christmas treat. If the Box is not delivered to me by midnight tonight, I will stop their precious ceremony if it’s the last thing I do! Robert Stephens is gloriously deranged throughout the episode, whether he’s ranting at Joe or counting his jewels and debating whether to leave everybody (including Sylvia) behind. As I’ve mentioned before, it’s such a wonderful pantomimic performance (apt for the time of year) that really makes the story zing. I also love the idea that his alter-ego, the Reverend Boddledale leaves to deliver his Christmas lecture to the pensioners. It would have been lovely to see that! Apart from showing us Abner’s continuing fruitless searches for the Box, the other major plot-thread concerns Kay’s quest to find a solution. 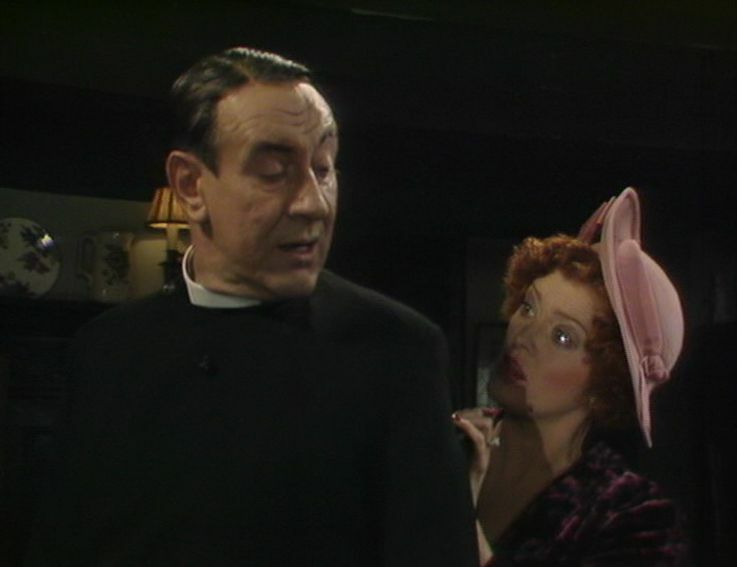 The Inspector is still no use – he refuses to believe that the Reverend Boddledale (a man he knows well) could possibly be a criminal – considering Kay’s continual accusations to be nothing more than an “hobsession”. So Kay decides to try and find Arnold of Todi. This won’t be easy – as Arnold is stranded somewhere back in time. 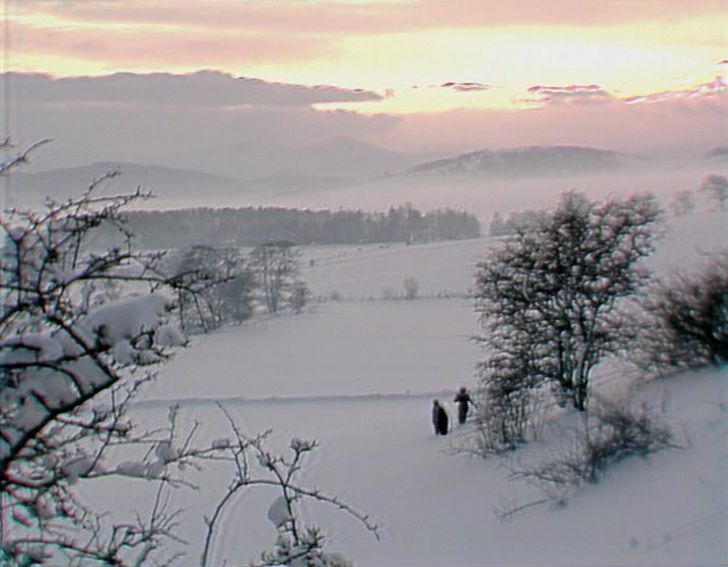 Herne agrees to send an image of Kay (which will cast no shadow) back – and there’s a possibility that he will be able to return to the present unscathed, although there’s no guarantee. Although Kay shouldn’t cast a shadow he clearly does (but then it would have been impossible to totally remove it) and he is successful in finding Arnold (Philip Locke) who lives in a fairly unconvincing world of CSO. It wasn’t uncommon for productions from the 1970’s and 1980’s to somewhat overdose on what CSO could do (and as we can see here, clearly couldn’t) and The Box of Delights certainly used CSO to the limit. Kay wants Arnold to take the Box back into the past (despite the fact we’ve been told several times that it’s impossible to do so). Arnold’s not interested, so this whole sequence doesn’t really go anywhere (and could easily have been excised). Kay does make it back in one piece and returns to spy on Abner. But he loses the Box – which is a problem since he’s reduced himself to only an inch in height. Abner has problems too – Charles, Joe and Sylvia are convinced that he’s going to double-cross them, so they decide to double-cross him first. Maria’s back – and she has a strange story to tell. She was scrobbled by Abner and his gang and offered the chance to join them. But Maria had a pretty low opinion of them and refused. Abner then asked her if she knew anything about the Box. Although Maria denied any knowledge, Abner wasn’t convinced. Sylvia then had a suggestion. “You can soon find out if she’s telling the truth! Put her in the scrounger! You know what the scrounger is, my dear. We put you in it, and it has a thing in it that goes round and round. That is the scrounger. And presently you come out as dog biscuit”. Maria’s interrogation is shot very nicely. The cell is quite small, with two barred windows (one either side) high up Sylvia appears first, on the one side and after a few minutes of fruitless questioning Abner appears at the other window (“Ladies, ladies! Do let us have unity”). The list of Abner’s captives is growing – Cole Hawlings, Caroline Louisa, the Bishop and other assorted clergymen – so it’s somewhat strange that he then allows Maria to go free. In story terms it makes sense, since she has to return to the others to tell them what she knows, but it does somewhat dent Abner’s reputation as a criminal mastermind. Still, Peter gets scrobbled later on – so it’s a fair swop, I guess. As this is the fourth episode of a six part serial, the story can’t really advance too far – therefore this installment has to mark time somewhat. But the last few minutes do fill in some of the back-story of Arnold of Todi (the original owner of the Box) and Cole Hawlings. Abner explains this to Joe, who is an odd choice since he’s always appeared pretty much clueless, but we can assume the information is more for our benefit than his. Have you ever heard of Arnold of Todi? Arnold was a philosopher in the Middle Ages. Now … did you ever hear of a certain Ramon Lully? He also was a philosopher in the Middle Ages. They show his tomb at Palma. But in those days, a philosopher studied many things in his endless search for knowledge. Ramon Lully travelled all through Spain and France and over the Alps into Italy, just to meet this Arnold of Todi, and to offer him his Elixir of Eternal Life in exchange for Arnold’s magic powers, which were contained in the Box of Delights. Arnold disappeared and he appears to be lost somewhere in the past – as the Box will allow you to travel back in time but you can’t take it with you (you need to find your own way back). Legend has it that Ramon Lully then took possession of the Box – and the image of Ramon Lully in Abner’s book is clearly that of Cole Hawlings. Director Renny Rye was keen to cast Robert Stephens as Abner Brown, although given his reputation as a heavy drinker, this was seen as something of a gamble. Rye got his way though and Stephens was no trouble at all – and it’s his brooding performance which adds so much to the quality of The Box of Delights. Stephens’ Abner is a man constantly on the edge (with only Sylvia being able to restrain him). It’s not subtle (it veers towards melodrama at times) but it’s perfectly in tune with the tone of the story – and he contrasts well with the apparently servile nature of Charles and Joe. Frankly, whenever Robert Stephens is on the screen, he tends to act everybody else off it. Abner’s partner-in-crime is Sylvia Daisy Pouncer (Patricia Quinn). She was formally Kay’s governess and has a low opinion of the boy. “That little ruffian. He was a child for whom I had the utmost detestation and contempt. A thoroughly morbid, dreamy, idle muff!”. Events take an unexpected turn when Maria (Joanna Dukes) turns up at Abner’s rooms. Dukes gives a lovely performance throughout as a girl who appears to have been thoroughly influenced by the latest gangster films (“I’ve generally got a pistol or two on me and I’m a dead shot with both hands”). Is this the reason why Abner thinks she’ll make a good recruit and decides to scrobble her? Logically it doesn’t make a great deal of sense, but arguing about logic and The Box of Delights is rather fruitless. The Christmas celebrations at the Bishop’s palace at Tatchester are delightful – and it’s a chance for the story to stop for a few moments to enable us to enjoy the Christmas mise-en-scene. But the news that they had a break-in during the party (Abner’s gang looking for the Box) highlights that danger isn’t far away. Since Abner doesn’t know who has the Box (he discounts Kay as surely nobody would entrust such a precious artifact to a boy like that) he goes through all the other possibilities. It doesn’t seem to be the Bishop, so maybe Hawlings gave it to Kay’s guardian – Caroline Louisa? Caroline Louisa’s disappearance en-route from London seems to suggest she’s been scrobbled by Abner, although a telegram for her seems to solve that problem. There’s still the question about what’s happened to Maria, but Kay and the others apparently forget about her and decide to sail Kay’s new toy boat instead. Charles, Joe and some others are after them though, so Kay uses the Box to reduce them all in size, enabling them to sail the toy boat down the stream. It’s an endearing sequence (the CSO looks as effective as CSO always used to do, i.e. not always terribly convincing) but it does work – especially at the end when the boat and its tiny occupants are facing a literal cliffhanger. The Box of Delights – Episode Two – Where Shall The ‘nighted Showman Go? 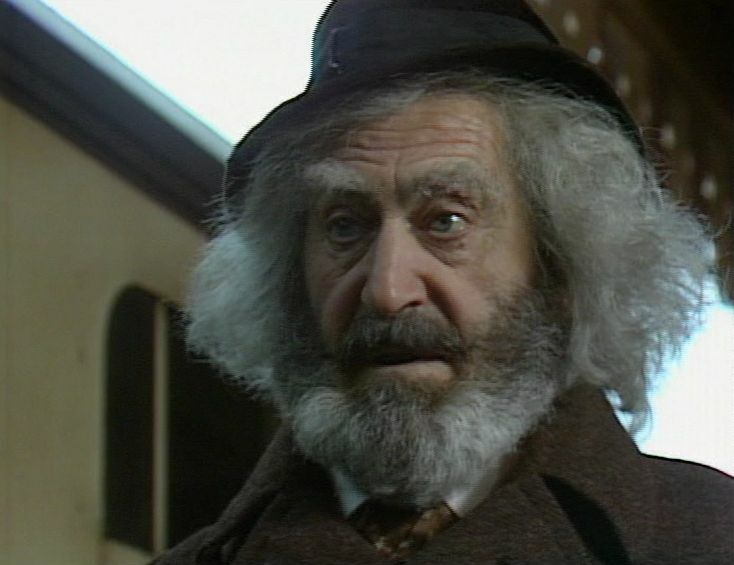 Given the potency of his performance, it’s remarkable how small Patrick Troughton’s screen-time in The Box of Delights actually is. The majority of his scenes are in the first episode, whilst in episode two he only has one scene of importance before disappearing. He returns at the end of the sixth episode but does little of note. Basically though, once Cole Hawlings passes the Box to Kay in episode two, his function in the story is over. 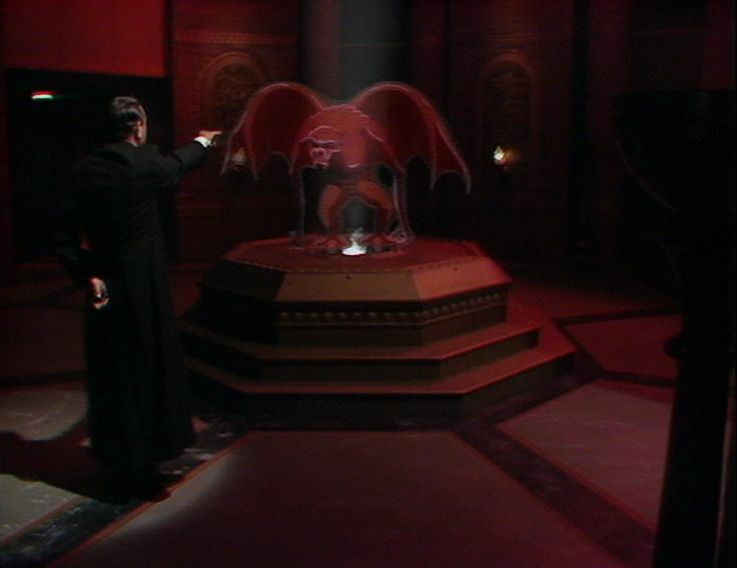 And whilst he’s still vague about what’s actually happening, he does share one important piece of information – the Box isn’t his, it belongs to Master Arnold who appears to be stranded somewhere in the past. After Kay and Peter witness the old man being scrobbled by Abner’s men, they report it to the Inspector (James Grout). The Inspector, of course, doesn’t believe a word of it, preferring to think that Hawlings was spirited away by some of his friends who were playing a prank on him. James Grout is lovely in this scene, as he is throughout the story. There’s a real warmth to his conversation with the children – he may disbelieve everything they say, but he’s never abrupt or unkind. It’s a staple of children’s literature that adults tend to not to believe anything the children say, forcing them to solve the mystery by themselves and the Inspector falls nicely into this pattern. There’s a major sequence with the Box in this episode – Kay ventures into the wood to meet Herne the Hunter and both of them are transformed firstly into deer, then into birds and finally into fish. It’s a gorgeous example of animation that is enhanced by Roger Limb’s fine score. This sort of animation was never cheap, but it’s immeasurably to the series’ benefit that they spent the money – even if it does look a little the worse for wear on the 2004 DVD release. If the original elements still exist, it would be nice to think they could be restored one day for a special edition re-release. The reason for this scene is obliquely explained to us by Herne. “Did you see the wolves in the wood? That is why we became wild duck. Did you see the hawks in the air? That is why we became fish in the pool. Now do you see the pike in the weeds?” Which seems to imply that there is danger everywhere, even in the Box – it’s not a safe haven. One thing that the second episode has lacked is an appearance from Robert Stephens. We have to wait until the final scene before we see him – but even though he has only a brief moment of screen-time he still oozes villainy, which leads us nicely into episode three. Where is that Rat? And where is the Box? As for the boy … that interfering, overreaching boy … reporting to the police, talking on telephones. What I won’t do to that boy!